To find early instructional books for children search the Library catalogue. In the large box enter phrases like "grammar early works" OR "mathematics early works" and click Search. In the column on the left of the results screen you can refine your results by scrolling down to Creation date and choose Before 1800. If this is a large list you can sort by date in the drop-down menu in the middle of the screen. Education in the 17th century focused on religion and morality. Often children were expected to learn by listening or reading adult dialogue in books such as Ludus literarius by John Brinsley. Written in the form of a conversation between two grammar school teachers and their debate about the best age to begin school. One school master advocates by the age of 3 and the other 6 years old, by which time they should have learnt at home how to read words of one or two syllables. The first instructional book for children to contain illustrations is thought to be Orbis pictus or the visible world in pictures. First published in 1658, it was illustrated with woodcuts. Our Library holds a facsimile of the 1672 edition. Later editions are available online. 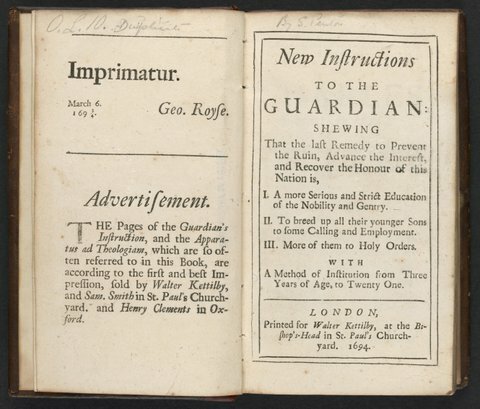 A late 17th century children's book designed to reinforce lessons about honour and integrity is New instructions to the guardian (1694). Evident on this title page is the use of a different typeface shown in the long 's'. All these books are in our Rare Books Collection and can be requested for use in the Heritage Collection Reading Room at the next available delivery time by phoning 8664 7002 or making a request in person at an Inquiry Desk.